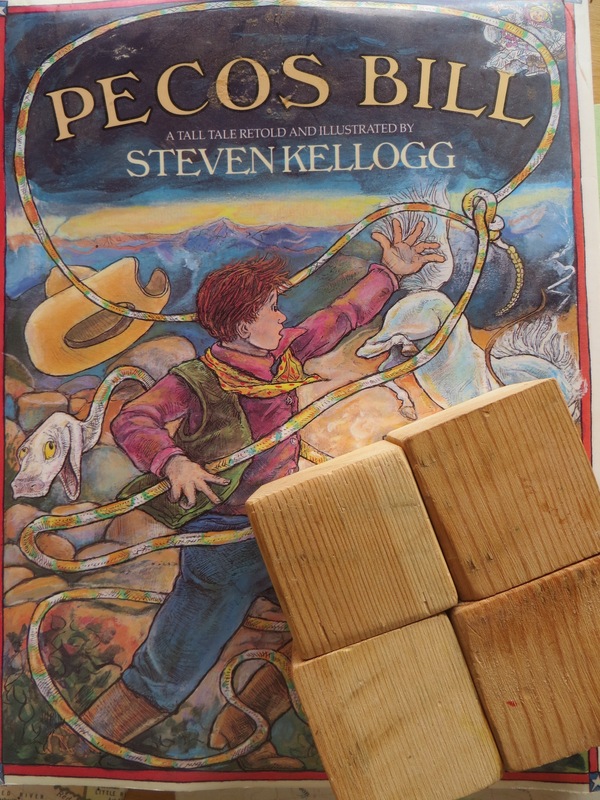 One day, when the twins were here, Wyatt found some plain wooden blocks. I had a plan for them at one time, creating a puzzle set of four blocks, like ones I’d made for Jaxon. Wyatt played with those blocks ALL DAY. Well, I decide I was going to give them to him for his birthday, but first I decided to make them into another block puzzle. Now, last time I did this, some of you were mortified that I would use an actual vintage book and destroy it in the process. This time it is a bit different… This was Daniel’s book once upon 25 years ago or so… and I saved it for him. However, along the way, it got wet, and the pages stuck together. It was a mess, ready for the garbage, but, I decided to give it life again. 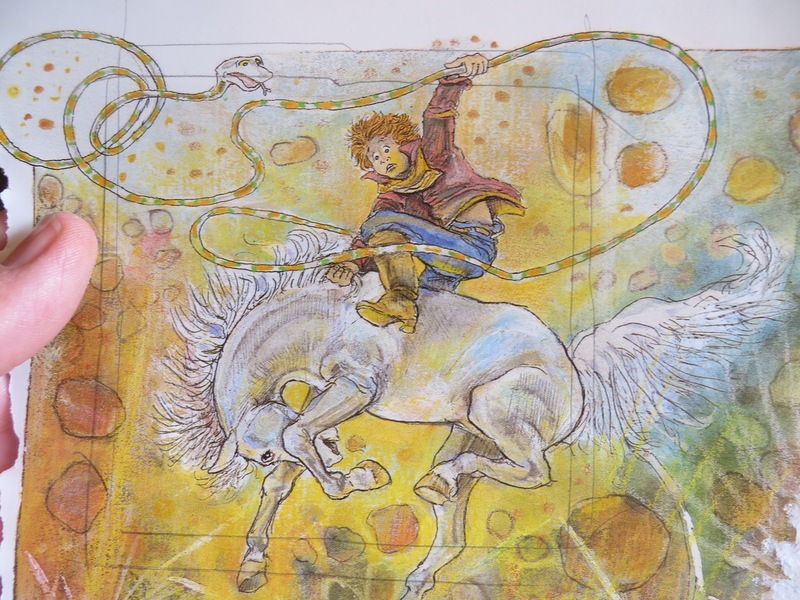 The book is laid open to a salvagable page, and I draw a light penciled square around all four blocks, making sure nothing important falls on the lines that will be the edges. 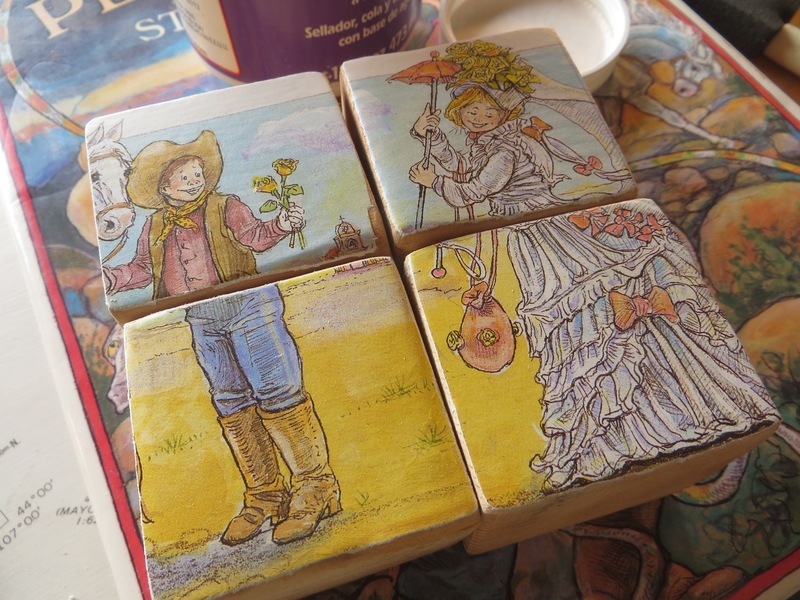 Wooden blocks are coated with Mod Podge and the picture carefully laid upon them. Care is then taken to cut them apart from each other. While insuring that they are firmly on each block, I then took sandpaper to the edge, actually running it down the edge of the paper, so that it ends up matching the wood perfectly. The process is repeated on all six sides. Multiple coats of Mod Podge are painted on, making a hard, waterproof (-ish!) set of blocks. 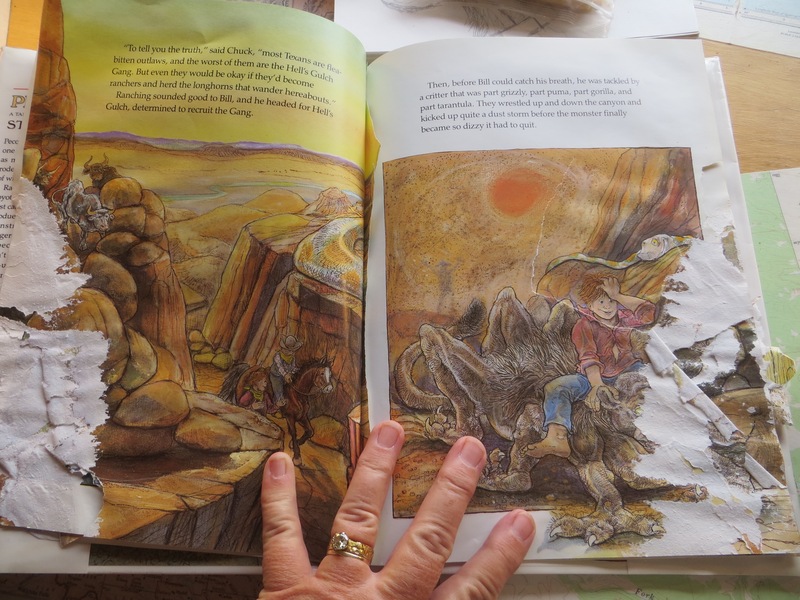 The beauty of it is… I also gave Wyatt a new copy of the book, so he can read and form the six pictures right on top of the ones on the page… making it a tad easier for a four year old to accomplish. At the last minute, I decided it was still too difficult, so I took some colored sharpies and created a uniquely designed “frame” around each picture, so it can be done much easier! 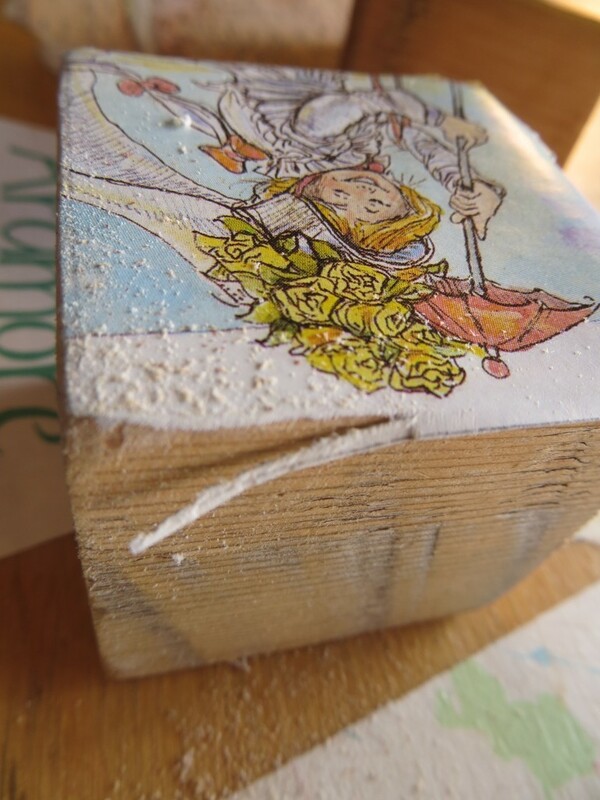 Beautiful idea for renewing something old and creating a one of a kind gift. Even as an adult I’d to play with those blocks! Thanks for sharing. Such a great idea! I remember you doing it for Jaxson, so I hope both little boys have fun with their “special-from-Grandma” picture blocks. Another great toy Carol. Your grandkids are so lucky and I bet you had a lot of fun and satisfaction making the blocks. My 8 and 4 year old GKs painted cheap white plates and bowls this weekend. We used permanent pens in Christmas colours. 8 year old spent so long on one plate she asked me to do the other. Yippee I get to paint. 4 year old was happy to just paint and draw on all of them. This is great. A toy that no one else will have. A keepsake.